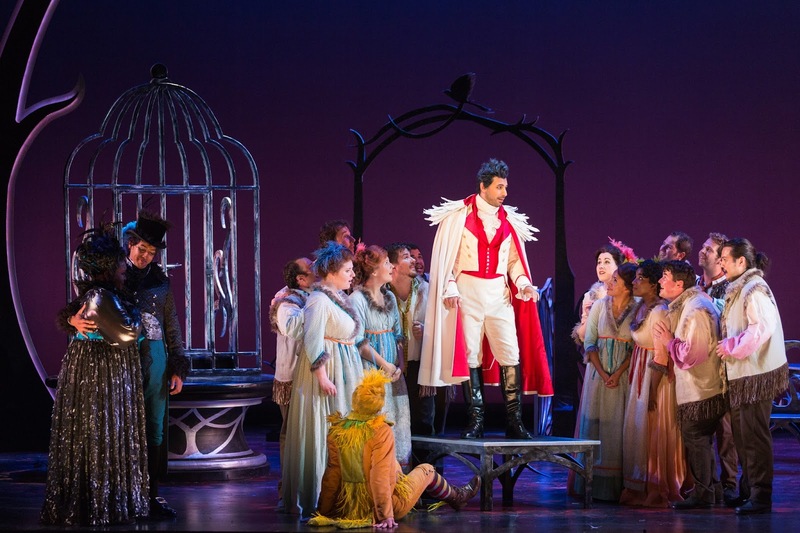 The Thieving Magpie (La Gazza Ladra, for sticklers) is a delightful opera that gets a rousing and captivating production directed by Peter Kazaras at the Glimmerglass Festival. Rossini’s 1817 romp has been assigned a number of tags but I think it is an opera buffa at heart but more about this later. Plot main: The lovely servant Ninetta (Rachele Gilmore) loves her employer’s son Giannetto (tenor Michele Angelini). Fabrizio, his father, approves; Lucia, his mother does not because she thinks Ninetta is a thief because of missing silverware. Subplot one: Ninetta’s father Fernando arrives as an army deserter sentenced to death. Subplot two: The town mayor has his eye on Ninetta and is prepared to blackmail her. We have about two and a half hours to enjoy the opera and solve all these problems. Rachele Gilmore as Ninetta, Ensemble member Simon Dyer, Musa Ngqungwana as Gottardo, Calvin Griffin as Fabrizio Vingradito, Michele Angelini as Giannetto and Leah Hawkins as Lucia in The Glimmerglass Festival's production of "The Thieving Magpie"
Our main concern is Ninetta who stands accused of theft, must protect her father and defend herself from the lecherous Mayor. Get a grip on yourself because she is convicted and sentenced to death. Soprano Rachele Gilmore with her delicious voice, vivacious manner and strong character leaves no doubt that she will pull through but she does come awfully close to losing all. Angelini as Giannetto looks and sound like a tenor that came from central casting, as they used to say. Tall, faithful, ardent, with a martial bearing and high notes that just fly from his chest, he never leaves us in doubt that Ninetta and their love will triumph. Bass-baritone Musa Ngqungwana sings exceptionally well as the lecherous and corrupt Mayor but let the latter have Ninetta? We wouldn’t trust him with a plastic magpie let alone an anthropomorphic or ornithological one. 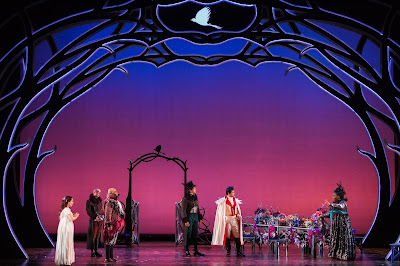 Leah Hawkins as Lucia, Calvin Griffin as Fabrizio Vingradito, Michele Angelini as Giannetto and members of the ensemble in The Glimmerglass Festival's production of "The Thieving Magpie"
Bass-baritone Dale Travis was disappointing as Ninetta’s father Fernando. He sounded almost hoarse and off his voice. Soprano Leah Hawkins was an authoritative Lucia and bass-baritone Calvin Griffin was her nice and obedient husband in good performances. You can’t have a thieving magpie without a magpie and that can be a plastic one in a cage or a dancer. Kazaras has choreographer Meg Gillentine in an ornate “magpie” costume greet the patrons as they take their seats in the theatre. She has a large cage on the stage and she dances in and out of it in a delightful performance. The opera is set in and around the spacious courtyard of Fabrizio’s house and outside the jail cells of the town. Set Designer Myung Hee Chung has her own idea for the large yard and the town setting. A large wreath (or is it the outline of a cage?) enfolds the front of the stage with a vista of blue sky in the background. The scene does change for the jail scene but the simple idea of the wreath remains. The Thieving Magpie has been described as a melodrama, a rescue opera, a tearjerker, a tragedy, a comedy and no doubt some other names. It is a classic comedy. The old try to interfere with the course of true love of the young; a dirty old man does the same; integrity is questioned but in the end wins. The usual obstacles of comedy are all there as is the happy ending. Kazaras does excellent work with all of those elements. The opera can take well over three hours to perform. He cuts it down to less than two and a half hours excluding intermission. The Glimmerglass Festival Orchestra and Chorus conducted by Joseph Colaneri maintain a brisk pace from the drum roll of the overture right up to the happy ending. A simply delightful evening at the opera.